I am looking for a 1000mm X-Carve. I live near Houston, TX. I’m looking to make a trade for it. I have some “tools” I’d like to trade for it. If you have one and are interested in trading, feel free to send me a text. 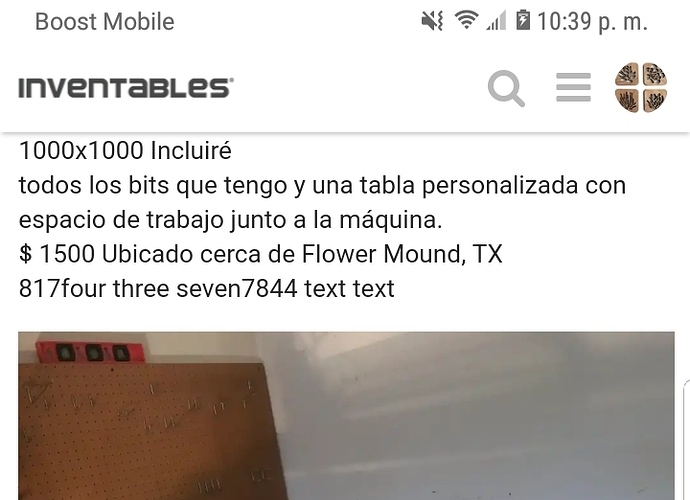 281-455-5542.
hello good afternoon could you tell me what kind of tools are you have live aki in webster tx 77598 and I have 3 cnc a 500x500 mm that I hardly use? This CNC 500x500 still availlable? ya no le instale un laser y lo use para dibujos sorry? This CNC is X-carve? Are you sell? Where are you located in EUA? Please send for me your contact (E-mail or Whatsapp), I very interested! Hello I wanted to inform you that I do not sell my machines because this year I start my own business from my garage if you want my help in programs and files I have no problems in helping you because that is the most expensive part of all this cnc I do not speak much English but I understand enough this is my number you can call me at any time 832-221-5921 johan manuel?